Posted on April 25th, 2019 in Goat's Forecast. Water temp is a very pleasant 23 ish – great for a swim before or after, but not so great fro a surf with very small to nothing conditions. Tomorrow morning expect something similar first off, then not a lot resulting from a SW change. Coming up a little through the week – not a lot – at places that are open to dead South, but quality may not be all that great. Thursday: down more 1 metre or less East. Sunny. The chance of morning fog, mostly in the west. Light winds becoming west to northwesterly 15 to 25 km/h in the morning then tending west to southwesterly 25 to 35 km/h in the middle of the day. Posted on April 25th, 2019 in Dee Why. A perfect morning for the Anzac ceremonies in Sydney. Wind was coming faintly from the west before 0800. The MHL buoy was seeing 0.8 of a metre from the east at 9 seconds apart. As the pictures show, the consequence at Dee Why was smooth but flat conditions. The forecast says we can expect sunny conditions all day as we go to a high of 25. The ocean is 21C according to Beacthwatch and all beaches are suitable for swimming. Tide was low at 0705 and will hit a moderate 1.24 m high at 1300. Go well with your Thursday! A high pressure system over the Tasman Sea extends a ridge to the northern New South Wales coast, while a trough is bringing a southerly change to southern waters today. This trough will weaken overnight, although a strong cold front is forecast to bring a vigorous south to southwesterly change to southern and central waters on Friday, extending to the Queensland border early Saturday. Winds should gradually ease later Saturday and Sunday as a ridge of high pressure from the west becomes the dominant feature over New South Wales. Variable about 10 knots becoming northerly 10 to 15 knots in the evening. North to northwesterly 10 to 15 knots shifting west to southwesterly 15 to 25 knots in the middle of the day, reaching 30 knots offshore in the evening. Around 1 metre, increasing to 2 to 2.5 metres by evening. Southerly below 1 metre inshore, increasing to 1 to 1.5 metres offshore in the evening. Southwesterly 15 to 20 knots tending southerly 15 to 25 knots during the morning then becoming variable about 10 knots during the afternoon. 1.5 to 2.5 metres, decreasing below 1 metre during the afternoon or evening. Southerly 1.5 to 2 metres, increasing to 2 to 3 metres during the morning. Posted on April 24th, 2019 in Dee Why. Home again for a few days, and hoping for a wave like everyone else, but it looks like we’re outta luck. Ocean at Dee Why looks to be ankle to knee high – on the bigger ones. Swell is about a metre from the east at 8-9 seconds. Wind’s out of the WNW as of 0830, but it should go around to the NE soon. Be interestng to see what the Goat says about our prospects for the coming week. His words of wisdom should be up by this evening. Have a top old day, and if you go looking for surf, may you find more than I’m seeing right now! A high pressure system over the Tasman Sea is directing east to northeasterly winds over much of the coast while a southerly change is forecast to cross the southern half of the coast later Wednesday and during Thursday in association with a front slipping to the south. Then a more significant front is forecast to cross the state on Friday, bringing a fresh to strong south to southwesterly change in its wake. Winds should gradually ease from Saturday as a ridge of high pressure from the west becomes the dominant feature over New South Wales. North to northeasterly about 10 knots. North to northwest about 10 knots turning southerly 10 to 15 knots from the late morning or early afternoon, becoming east to northeasterly 10 to 15 knots during the evening. North to northwesterly 10 to 15 knots turning west to southwesterly 20 to 30 knots during the day. Around 1 metre, increasing to 1.5 to 2 metres during the evening. Southerly below 1 metre inshore, increasing to 1 to 1.5 metres offshore during the evening. Posted on April 23rd, 2019 in Surf Reports. Posted on April 22nd, 2019 in At large. Light NE breeze as of 0700 in Sydney this Monday morning. The latest MHL data shows 1.4 metres of east swell at just under 10 seconds apart. Looking at various cams around Sydney this morning reveals that those numbers are translating into smoothish, but weak and lumpy little knee to waist high plus waves around the place. Stretches best aligned to the swell direction are seeing the occasional chest high face on take off. Not the greatest conditions, but you could get wet. Tide is coming into a 1.5 metre high at 1030 this morning. Should be a mostly fine day with a high of 26. According to Beachwatch, the current water temp is a pleasant 21C. Tomorrow should be showery with more of the current marginal bump. The just-surfable conditions should persist through the middle of the week, but the trend is gradually downward. The latest long range projections show it staying small through into next week. In grey Gippsland this morning, about to roll east toward the coast, leaving Vicco behind. Just checked the situation at Bells and it seems there’s just enough swell for them to start throwing some heats in the water. Judging from the cams along that coast, it’s in the waist plus range, a bit sideshore and bumpy. 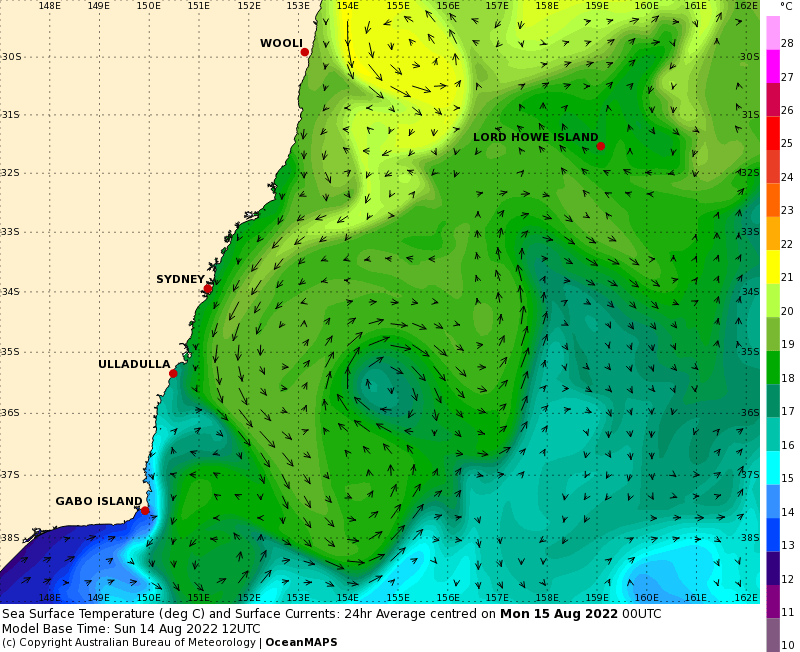 Latest swell forecast is showing some hope for a bit more size in the Torquay surf zone late in the week. Hope to have a postcard to share later today… so check back later and have a top old Monday! A high pressure system over the Tasman Sea is maintaining a ridge towards northeast New South Wales, and directing east to northeasterly winds over most coastal areas. Meanwhile, a low pressure trough is moving into the state’s west, associated with a cold front passing to the south. This trough will bring a southerly change to southern parts of the coast today, continuing through to central waters on Tuesday before stalling and decaying. Following this, the Tasman high is expected to have a brief return to dominance, before another trough and southerly change in the second half of the week. Partly cloudy. The chance of a thunderstorm late this evening. Northeasterly 10 to 15 knots. Winds inshore may briefly turn southerly about 10 knots during the morning hours. Northeasterly around 1 metre inshore, increasing to 1 to 1.5 metres offshore. East to northeasterly about 10 knots tending north to northeasterly 10 to 15 knots during the afternoon. Posted on April 21st, 2019 in At large. Actually got some small waves at 13th Beach yesterday. Water about 18 too, so not bad in a springy. Posted on April 20th, 2019 in At large. Looking like another sunny day down here in Melbourne. Sadly the swell models earlier this week were wildly off the mark and we’ve just learned that the Bells contest is having another lay day. They could use the conditions you’re seeing in Sydney. Speaking of which, there should be a few fun waist to chest plusses at east-optimal spots today – ie, pretty much everywhere in the Sydney region. The cleanest conditions will be early when the full tide will also be a factor. As of 0630 wind along the beaches of Sydney was coming lightly from the west. It should stay light for the early session but gradually come around to the E-NE by lunch time. As of 0500 the MHL buoy was detecting 1.3 metres of 10-second swell from the E by ESE. That means it’s at about the same intensity as yesterday evening, but not as big, or south as Friday morning’s session. The first tide of the daylight hours is a swampy 1.7 m high at 0850. That’ll drain away to 0.35 low at 1455. Outlook is for wind to be more around to the NE tomorrow and Monday and for the swell energy to fade somewhat. Tomorrow morning could be fun for the early (tide not withstanding), but probably a little smaller than today. The new week looks small and fading toward tinyness by Friday. But then, if the models have it right, we could see a potentially solid south swell event around Saturday. A high pressure system over the southern Tasman Sea extends a ridge along the New South Wales coast, whilst a trough offshore weakens. Little change to this pattern is expected until a cold front skims southeastern Australia on Monday, bringing a southerly change to the southern half of the coast. East to northeasterly about 10 knots increasing to 10 to 15 knots in the middle of the day. Winds inshore tending southerly about 10 knots until the afternoon. Below 0.5 metres, increasing to around 1 metre during the afternoon. Partly cloudy. 50% chance of showers. The chance of a thunderstorm offshore. Easterly 1 to 1.5 metres, decreasing to around 1 metre later in the evening. 1.5 metres, decreasing to 1 metre during the morning. Partly cloudy. 50% chance of showers. The chance of a thunderstorm in the afternoon and evening. Posted on April 19th, 2019 in Surf Reports. Greetings from country Victoria where your correspondent is currently heading south to Bells. Should get there about midday, which will be when they make the call to start the day’s heats – or not. If possible I’ll post some pictures. As for Sydney, the MHL buoy is showing 1.3 metre SSW wind bump at 7 seconds and the BoM says wind as of 0800 is light south. High tide is peaking at a swampy 1.8 metres. Wind should stay light and variable and apparent swell direction should be east – but gutless and tiny. 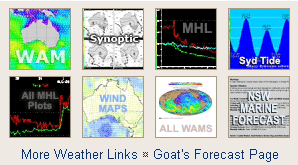 As for the outlook, well it’s Friday, so the Goat has rolled out a fresh forecast to have with your hot cross buns this morning! Have a good Good Friday everybody. A trough along the coast will decay today as a high pressure system near Tasmania strengthens a ridge across the area, directing south to southeasterly winds before tending northeasterly in the south later today. Little change is expected to this pattern until a cold front skims southeast Australia on Monday, resulting in a southerly change along the southern half of the coast. Southerly 10 to 15 knots becoming variable about 10 knots in the late morning. Easterly 1 to 1.5 metres. Partly cloudy. The chance of a thunderstorm offshore. East to northeasterly below 10 knots increasing to 10 to 15 knots in the late afternoon. Partly cloudy. 50% chance of showers. The chance of a thunderstorm. Posted on April 18th, 2019 in Goat's Forecast. Beaut weather for the school hols. Hope everyone’s having a good time… kids, mums and dads and others. Whether you’re in Sydney or up the coast, where a lot of people seem to have gone, there looks like being waves of some sort everywhere for the coming week. Mostly medium to small from outta Easterlyish directions, but waves for a bit of fun nevertheless. Thursday: down a little say 1- 1+ metres from the East. And Remember the Diggers on Anzac Day. Water temp is around 21, 22. Mostly sunny. Light winds becoming south to southeasterly 15 to 20 km/h in the evening. Partly cloudy. Slight (30%) chance of a shower and the chance of a thunderstorm. Winds south to southwesterly 15 to 20 km/h becoming light before dawn. Mostly sunny. Light winds becoming northeasterly 15 to 20 km/h during the day then becoming light during the evening. Partly cloudy. Medium (40%) chance of showers and the chance of a thunderstorm. Light winds.